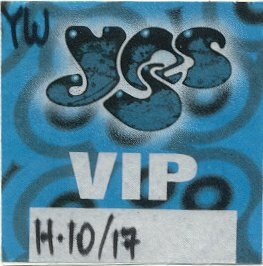 Yes opened their 1997 North American "Open Your Eyes" tour tonight in Hartford at the Meadows Music Theatre. Living barely fifteen minutes from the Meadows, my brother and I were able to attend the opening night show. As we walked into the theatre we could hear a recording of nature sounds which sounded like they came from Jon Anderson's recent solo effort, "Earthmotherearth." These sounds played in the theatre until Yes started their show. Every now and then, the bird songs would be accompanied by vocal samples from their upcoming album, "Open Your Eyes." We would hear the nature sounds and all of a sudden we would hear the phrase "Wish I Knew" which we could recognize from the single, "Open Your Eyes." Other phrases were played, some sounded like they were from fairytales (One of which actually said "Round and round and round we go, where we stop nobody knows"). Most were in Jon's voice, but some were sung by Billy Sherwood and Chris Squire. The vocal phrases continued and got louder and louder the closer we got to show time. They were later accompanied by what sounded like clock chimes which also got louder and louder until the show started. The stage design was set up like a tent with a cloth covering kind of hanging over the stage. The band's gear was set up inside this "tent". There were four microphones set up in the front of the stage, Steve Howe's setup on the far left, with Jon's closest to him. Chris' was next to Jon's and Billy's was on the far right. Igor's keyboard rack was behind Steve and Alan's drum set up was to the right of that. The show started at around 8:15. The lights dimmed and the bird songs got loader. It sounded as if they were playing the beginning of "Close To The Edge" through the theatre as the crowed anxiously awaited for Yes to take the stage. Finally, the six members of the band came out and instead of playing the beginning of "Close To The Edge" as it sounded like they were, they ripped into "Rhythm Of Love." They played "Rhythm Of Love" pretty much the same as they have played it the past few years. Steve wasn't doing much in the beginning, as Billy was playing and singing most of Trevor's parts. Nothing too surprising happened on this song. Billy, Steve and Igor took turns doing solos at the end of the song. The solo in the middle of the song, after the vocal break, was performed by Billy. This was one of the few times all evening that you could actually hear Billy playing. The band played "Siberian Khatru" next. This sounded pretty much like the version on "Keys To Ascension." What really impressed me was the way Igor played. This guy has some chops. Igor looks to be very young, maybe in his mid twenties. He is thin with blond hair and kind of moves like Tony Kaye while he is playing, but sounds like Rick Wakeman. He had all the parts down to "Siberian Khatru." It is curious that they chose to open with "Rhythm Of Love" and not this = one. The only reason I can think of is that they wanted to feature Billy on the opening song to show off the new line-up. It was impossible to hear what Billy was playing on this one. Jon greeted the audience before the next track. He commented on how this is the first show of the tour and introduced Alan White by saying that Alan refused to do the concert unless they played the next song. The band then started playing "America." Steve jammed on the extended solo toward the end of the song. The band was in good form, as again this sounded like the "Keys" version. The next song they played was "Open Your Eyes." Jon introduced this one saying that you may have heard it on the radio. The band was a little rough around the edges on this one, as it sounded a little disjointed. They seemed to get it together better toward the end of the song as Steve played an extended solo. Jon's vocals were much more prominent on the live version than they are on the single. I picked up my brother Friday October 17th from Newark airport and we drove up to Hartford, Connecticut for the opening show of YES's North American Theatre Tour. We originally had 21st row for the show. Through a bit of "dealing" prior to the show, we ended up sitting 2nd row center, right between Jon and Steve! Being that my brother lives in Los Angeles it is always a magical and nostalgic time together, this time amplified by the highlight of the visit - a trip back in time through the time machine called classic progressive rock, our guides; the masters of the art. 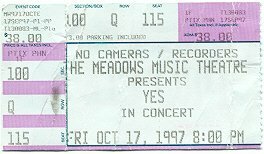 I followed up by seeing YES yet again Sunday night in my home state of New Jersey. It was a weekend I will always remember. Surrounded by family and friends and inspired by soul touching music. I felt what life is or should be all about; love and joy. I wish that in abundance for all who read these words. First, let me tell that I was really into Yes starting about 77. Caught them in 77, 78, & 79, all in New Haven, CT. I have absolutely NO USE for ANYTHING the band did after the break up of the quintesential line-up (Anderson-Squire-Howe-Wakeman-White). In fact, the only thing that spurred my interest in this tour was when this line-up got back together. I was disappointed when Wakeman left, but the essential members (Anderson-Squire-Howe) remained, so I went. Now you know what kind of Yes Fan your dealing with, so read on if you choose. Squire. Outstanding. Not much more I can say. Did he ever leave? Didn't sound like it. He was having a great time and playing like he was still on top of his game. Anderson. No complaints. His unique voice is still quite solid. There was, to me, a sense that the tunes had matured well with age, as had Anderson. When I saw him in the 70's, he always wore these white Angelic kinda things. Nice to see him in a pair of sweats being comfortable and enjoying himself. Howe. Don't get me wrong. I wouldn't have had anyone else up there, but (Sorry Steve), Steve's better days are behind him. As an outstanding player, that means he was just real good, not outstanding. There were moments......real nice moments when I said, "Yeah, that's the Steve Howe I remember". Many other times though, he sounded out of sync and somewhat flat. He's lookin' REAL old, too. As for the hair.....give it up Steve, just shave it. White. Alan was right on all night. No problems here. Thanks for getting 'America' in the setlist. Igor. Some nice young blood for the band. Jon introduced him as an outstanding player who loved Yes and knew Rick Wakeman (his material) well. That he did. He covered Rick's parts more than adequately, and added his own flavor opportunistically. I read lots of folks complaining about him being down too low in the mix. Funny, my distinct memory of one incident is just the opposite. During Roundabout, after the bridge when it slows down and Steve plays his famous guitar part for the 2nd time, Igor was WAY too loud. Both Steve and Jon leered at him and he got the message. Welcome aboard Igor. Billy Squire......I mean Sherwood. What's up here? Here's the run down. About three times during the show, Billy stepped up to play a guitar solo that could be heard on just about any Twisted Sister album. For the rest of the show, he stayed in the shadows playing nothing but chords, and being very low in the mix. You know, he looked like some kid that had won some radio contest...."we draw your name, you get to play with the band". Two exceptions worth noting. He added some EXCELLENT background vocals to LDR, and his 12 string added nicely to RSG. As for the set, I, as you can imagine, was disappointed with ROL. I don't mind telling you I was there for the old material. If you don't like it tough. I've changed a lot since the 70's, and I still like THAT music. Not sure how much interest I'll have in new Yes material, and certainly no interest in anything after Tormato (which wasn't a great effort, but it came out at the height of my interest, so.....didn't mind not hearing anything from that). I thought 'America' was not as tight as it could be. Nor was AYAI, but the "tuning" opening was real nice, and over all, it was nicely performed. The best performed songs of the night, IMO were LDR and RSG. ISAGP was done very well, too, with the crowd very into it. 'Roundabout' was a run through. 'Starship Trooper' was a nice bonus. White had left his kit for the final bow. You could see Jon discussing an "extra" tune with Chris, then Steve. It was very well done. Fantastic seats, many thanks to YesWorld- they were kind enough to let me switch concerts, as I couldn't make it to the show I'd originally reserved-absolutely first-class treatment. A great feeling overall-Jon and Chris seemed especially playful and having a blast. The bass sound was killer; the keyboards mixed murky, Steve's guitar underamplified in the house (well, I'd like it to be LOUD). Jon's voice is in fantastic shape; I'd think that getting older would lower the range somewhat, but he's as there as he's always been. Billy's guitar presence limited to a couple of solos, lots of plugged-in acoustic strummery. He does the Trevor Guitar God thing a bit, but not quite as fleet a player, for what it's worth. Good harmony vocals. (CAUTION: GUITAR_GEEK OBSERVATIONS) Steve is great; as a guitarist I miss his older Dual Showman tone that seemed a little 'rockier'- the Twins are clean. His playing is also as great as ever, and his steel playing possibly better than ever. Chris' bass sound as I said was huge, and his playing is as usual-inventive, creative, and a good fun to watch. Igor did fine in the keyboard-support role; kind of a color man, so to speak. I'm an old guy (38) and get the most satisfaction from the earliest stuff I first heard when I was 13 or so; the new material just didn't make it for me on an emotional level, but it was good to hear what they are up to these days. Flame me not, it's just an opinion. At times the 6 pieces seemed a bit busy, but not like the Union band, which in a stadium-type setting was pretty clangorous. 'And You and I', 'Siberian Khatru', 'The Revealing (! )', 'America (!!)' and 'Starship Trooper' were particularly fantastic. I never thought I'd hear any live Tales material. A definite satisfying show for this '70's era diehard despite no Relayer or Going For the One stuff. The few rough spots or 'mistakes' (first night of the tour and all) were taken in stride; I even saw Chris laugh off a couple of flubs, which was really endearing-the spirit on stage was wonderful. So, however excited you are to see them, be prepared to have your expectations exceeded. Just saw the show at Hartford, and I have a mixed review. Over all the show was good, I've seen better from them (Union) and i've seen worse(Talk). The stage was small and not much of a typical Yes light show, I guess they wanted to focus on the music. the stage looked like parts left over from past tours that the band members had in their basements. the music did shine thru at points, i thought 'Siberian Katru' was well done with Ivan hitting the great Rick solo in the middle. It was really great to see Chris finnaly playing the bass again and not just being a backup to Trevor. He also looked like he was having fun, although what the hell was he wearing? Alan was right there as always and Jon was, well he was Jon. Steve looked like he has seen better days and his guitar playing was kind of spastic, not melodic like we used to see. Opening nite jitters? Ivan was great hitting all his solos although several times it sounded like his keys were turned off. And as for the new guy Billy Sherwood, What the hell was he doing there? besides playing a couple of Trevor solos he just sang and played rythem. He definitly looked out of place. The crowd seemed to be enthusiastic standing thru most of the show. there was several technical difficulties as Jon even commented that what do you expect it's opening nite. I was really looking forward to see the artwork but neither the artwork or the band was in the lobby as promised. The other disapointment was no tour guides. and the shirts were priced $25 to $50 dollars, give me a break! Over all I would rate this one as ok.
hope the tour gets better as it progresses. Billy was almost invisible for most of the show, I think. Igor seemed to be more the "official" member than Billy did. Jon gave him a nice intro, too. I'd love to see them take out "No Way" and put in HotS... I'd also love to hear them replace Rhythm of Love (even though I like BG)... the crowd was pumped and yelling, and when they started ROL, it kinda sucked the enrgy from the room temporarily. Same thing when they played "No Way". Great show! The setlist needed one more surprise, IMHO, but was still a nice cross section of stuff. The band sounded tight. Rick who? Igor (Ivan) was great and will only get better as he gets more familiar with the material... and he sang too! Billy played Trevor's two solos and mostly rhthym guitar and vocals. We had Yesworld tix and were FRONT ROW DEAD CENTER... the two best seats in the house. New Material: "No Way We Can Lose" could have been called "Saving My Heart '97"... NOT what I want to hear from these guys- too poppy and real weak. "Open Your Eyes," however, was great live, as was "Children Of The Light." We talked with Billy and Steve extensively after the show. Steve wasn't happy with "No Way" last night either, and mentioned that they may drop it from the set. He also said the band has fully rehearsed "Tempus Fugit"- without Jon of course, but there's a chance they'll sneak it in. Interestingly, though, he seemed less covinced of sneaking in "To Be Over." He was very nice and surprisingly conversational! Billy was very nice too. "Revealing" was great- Jon nailed the chant perfectly! Steve also had two blazing solos on the Trevor stuff. His "Owner" sounded great! Whitefish had its usual "Soundchaser," "Ritual" and "Tempus Fugit" bits in it. At Jon's behest, looks like changes for the setlist are in store... adding at least "Heart Of The Sunrise." The show was great. All those going, you're in for a treat! Today, after work, myself and three friends, walked in (The doors were actually open) to the Meadows Theatre, in Hartford, and hung out for over an hour while Jon, Chris, Steve, Ivan and Billy were preparing for tonights dress rehearsal. We were there because, one of the three was there yesterday and heard 'Siberian Khatru' twice and 'America' - Before he was asked to leave. We heard teases for a lot of songs, from each individual, but no full versions. All of a sudden Jon and Chris walked by us. Jon and I briefly looked at each other and I said Hi as he passed. Chris passed right next to me. We noticed that people were closing the doors and we thought that maybe we were going to be able to listen to the final rehearsal - when BANG one of the crew (producers???) told us that we could not stay any longer. But at least I said hi. Hi my name is Dave and YES has been my fave band for abot seven years now. Anyway here's the info on the tour. First there are only 3 different shirts available and no tour book. Sorry. That was it for merchandising. The stage was set up very intimately. There was a canvas tent enveloping the equipment (sort of like a cross between the Tales stage and Jon's Hopi meditation chamber). The band played nonstop for 2 hours and 40 minutes. You may not believe that they played a couple of these songs believe me you are just as suprised as me to see Howe playing Rabin's material). Overall the show was extremely good. They really gave the fans a quality performance. A couple of notes. The show went very well for opening night of a 3 year tour. There were about 8000 people in attendance. The new Keyboard player was very adept. 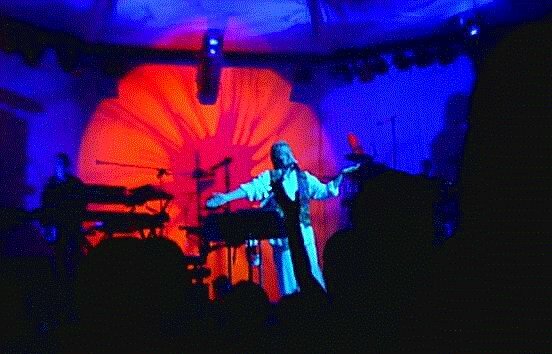 His sound and style were reminiscent of modern Wakeman. Overall I say he is better than Downes but not quite a Moraz. Billy Sherwood provided some unexpectadly good vocal support. Squire had the most energy and a killer sound. There were quite a few mistakes but most were unnoticeable miscues (nothing show stopping). Anderson said that the new album comes out Nov. 25 titled "Open Your Eyes." Pre-show music was a tape of Anderson/Squire harmonized excerpts interspersed with new age soundtrack. Price of Admission $30-40. Once again, we were hijacked for YES merchandise. T shirts were $25, $27 dollars, and a button denim shirt for $50. No programs. Just a few observations about the show. Overall a great performance by the band, with new members Billy Sherwood & Igor Khoroshev mixing very nicely with the classic members of the band. The show had a great sound and every member, especially Chris Squire who seemed to be having the best time playing in years, really sounding great. It's just too bad they didn't have a better setlist. I must say this was the shortest and most disappointing selection of songs they've done. Do we really need to hear 'Siberian Khatru', 'America', and 'Revealing Science of God' so soon after they were played at SLO? Why not play something like 'That, That Is' or some of the newer Keys material we were promised. We didn't even get to hear 'Mind Drive' or 'Footsteps', which were supposedly a given for this show. What we did get was 'Open Your Eyes', which IMO is only marginally better than 'The Calling' and a song I think was called 'We Can't Lose' which was clearly the lowpoint of the show. It was so bad Jon apologized for it adding, "We're trying. It's the first show of the tour. It'll grow on you..." The other new offering ('Children of Light') we got was far and away the best and seems to lead credence to my suspicion that the Keys 2 material is much better than the Open Your Eyes/Chemistry material on the newer Yes release, which is all the more disappointing is that instead of moving in the direction of the stronger material they are moving away from it. Surprisingly enough, the highlights of the show were the solos! Steve Howe surprised me by playing 'Masquerade', a personal favorite of mine, and Chris Squire & Alan White were just incredible during the 'Whitefish' solo, with Jon actually singing a quick chorus of "Yes, Yes!" during the 'Tempus Fugit' part. It was also great to hear Leaves of Green. And even Ivan can play pretty well! So why not give the guy some more challenging material to play: 'Gates of Delirium' anyone? Although the usual standards ('Owner', 'And You & I', 'All Good People', 'Roundabout', 'Starship') have become somewhat tired and predictable they were well played, and hey it wouldn't be a Yes concert without them. Overall, a good show, I had fun. It's great to see Yes live! Here's hoping they make the setlist a little more creative next time. How about 'Yours Is No Disgrace' (it's been a while), something from Relayer, Rabin-era songs other than 'Owner' & 'Rythym of Love', 'South Side of the Sky' (I know I'm dreaming), or even some more new songs from KTA II...and why don't they play 'Wondrous Stories' anymore? That's one of their best tunes! My thoughts: I have never seen Steve play like he did tonight. No words can describe his performance. The new keyboard player is fine. his mix was way down, and he kept motioning them to raise it. I don't know why Billy Sherwood was strumming an acoustic guitar most of the night. The venue sucked. I have not been treated this way since 1976. Everyone was completely frisked at the entrance. No cameras allowed. You had to sign a waiver to buy alcoholic beverages. Police were walking thru the performance. It was an embarrassment to the fans that we were treated like this. We have been asking the band to let us take pictures without hassles for years, and it has always fallen on deaf ears. The bands performance was almost perfect. A few mistakes, but incredible. I don't get why just 'Soon' was done. I thought the whole point of getting rid of Wakeman was to do 'Gates Of Delirium'?? I will be in Albany Tuesday, I hope it is a better atmosphere there. Hartford 10/17 - there was a no show for 'Close to the Edge', they played the 1st side of Topogrphic. No 'Heart of the Sunrise' or 'Perpetual Change'. They played the old stuff great. New music was ruff at times. Jon was very strong / Chris was real good and needed no lyric sheets / Alan was great / Steve was very good with minimal show boating / Billy was a good supporter with a couple of chances to solo / Igor was a good fit and played very close to original recordings. Short Review because it's one o'clock in the morning and I'm F! @$$# tired. It was disappointing that the band opened with 'Rhythm of Love'. Although they made up for it when they blasted through 'Siberian Khatru'. Howe was playing very well and so was Squire for that matter. Koreshev was seen and not heard. The band had his keyboards turned way down. This was alright, however, because Howe's guitar was turned up much louder. White was decent as usual, however, poor Jon had great difficulty in remembering his lines (Alzheimer's is finally kicking in) although I'm sure he'll improve with a couple more gigs under his belt. 'America' was great and so was RSOG. Could have done without the Rabin stuff but Howe did a great job with it. 'Starship Trooper' was a great nightcap. Would have rather heard some things off of Relayer and no GFTO was played. All in all the performance was solid and the older fans will no doubt like what they hear. Did hear some snippets from White's drum solo in 'Ritual' during Squire/White solo. Enjoy everyone, my next show is in New York on Halloween. [About Yesworld seats]I got a pair of good seats, best seats in the house actually: front row center. Jon Anderson directly above us and Chris Squire's wife and other bandmembers' wives behind us! Imagine that, better seats than the band's family members. Thank you Yesworld! O.K., I've been a YES fan for ages, they were the first group I ever listened to and recognized by name. They were my first concert, as well, on June 15, 1979 in New York City. I am a BIG fan of YES. All this being said, the show was weak. I knew I was in trouble when they chose 'Rhythm of Love' as an opener. The set picked up a little with 'Siberian Khatru', but the performance, like many others of the night, seemed uninspired. Following SK was 'America', one of the better performances of the night. Next up - a new tune called 'Open Your Eyes', followed by 'And You And I', complete with introductory guitar tuning. 'No Way We Can Lose', a song off the upcoming album...errr...CD was a nice piece, very popish and ladden with 'Andersonesque' rhythms. Next up was their "Only top 10 hit", 'Owner of a Lonely Heart'. 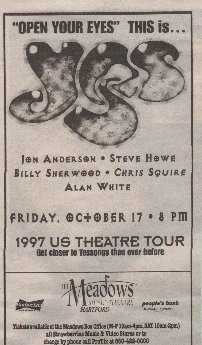 Steve Howe then took the spotlight and played a spirited solo containing 'Marquerade' and 'Clap'. He was then joined by Anderson for the ending section of 'The Ancient', though Anderson came out late and forced Steve to screw up the piece. After this, another new song was played, and I didn't catch the title. Next up was Squire's turn to take the spotlight, and the band played 'Long Distance Runaround', followed by 'The Fish'. The real treats of the night followed in quick succession: 'Soon' and 'The Revealing Science Of God', back to back. It was during 'Revealing Science' that you could tell it was DEFINATELY opening night, several sections were botched, but the overall piece was done well, and nice to hear. The show ended with 'All Good People'. Two encores were played, 'Roundabout', and then 'Starship Trooper'. The local classic rock radio station in Hartford (WHCN) had Jon Anderson and Steve Howe in the studio this afternoon. They have been rehearsing at the Meadows Music Theatre most of the day and will do the same tommorrow and on Friday before the long awaited tour begins. YES IS IMMINENT!! Thank you so much, thank you. Is this a dream? Is this real? Are we really here? I'd like to say a big hello to everyone tonight. Thanks for coming to this auspicious occasion, the opening night of our three year tour. Taking us�taking us into the 21st century�and uh�as it happens, Mr. Alan White said that he wouldn�t come unless we play this next song. Lets hear it for Alan White. And here is one of his favorite songs. Here we go. Thank you so much. This past year has been quite an interesting year for us. We nearly went on tour, yes as you know. One of the reasons we didn�t is because we started to write some new songs, with the production and help of Billy Sherwood over there on our left, and uh�let�s hear it for Billy�.and uh, Chris and Billy got together with a lot of songs that we wrote together and eventually pulled together, and this is one that you might have heard on the radio. It�s a song called �Open Your Eyes�? Open Your Eyes. Woo. Thank you so much, thank you. I need a towel. Those chords�all those chords. I remember quite uh, vividly many many years ago, we were in the studio getting ready to record a song, and uh�during the course of getting everybody sort of organized, you know you look around the studio and you say, Alan is in place, and everybody is in place and Chris is�.somewhere. He�s coming, oh Chris is here�there he is. And then, you look around for Eddie Offord who was our producer in those days, and uh.. he was in heaven somewhere having a really nice time. I call heaven the control room where we recorded the song. And uh�as it would happen Steve just started tuning up or playing around, that�s when I said �You know, Eddie�just keep the tape rolling because we are not quite sure when we are going to start the song.� So this is really how it started. Okay, it�s the beginning of the tour. We�re trying�we�re trying to get it together here. But it shall come around as they say. It shall work, it shall come around. During the course of the last zillion years, we�ve actually, I believe, I believe this, had one seriously major hit record. Okay, we�d like to play it for you now. So here we go. Get ready. Thank you so much. Thaaaank You. Thank you so much. As uh� in the past, you�ve all been very, very fortunate to enjoy some of the quite incredible performances and playing, amazing dexterity, in his fingers and the sounds of his guitars. Let you enjoy the next few minutes with Mr. Steve Howe. Well I�m glad you enjoyed �Clap� there from �The Yes Album� originally. We�re going to carry on now with an excerpt from a uh, very vast piece of Yes music, and I think you�ll, maybe you�ll sing a long gently when Jon joins me soon. We�re going to try a new song. This is from, uh.... Keys To Ascension 2. Every now and again I get very fortunate to hear some wonderful musician for the first time on cassette. And uh, I�d like to introduce you to a really wonderful guy. Really is all the way fantastic musician and he loves Yes very much, and he knows Rick Wakeman very much. I want to introduce you to Igor Khoroshev. This song I�m going to sing, really �. a very simple idea, simple lyric. I sort of equated it to the idea of chasing, looking, very hard for the spiritual reason for living. Sort of a �Long Distance Runaround,� chasing it all the time. Mr. Chris Squire! On the drums, Mr. Alan White! So many, so many times writing lyrics, songs, ideas, � must have been about 20 years ago this song came through. And I was sort of afraid to sing this song. I must say. Why should I sing this song? Why should I want to sing this song? Here we are 20 years later, I know I want to sing this song. Want to take this opportunity to thank you all for coming this evening to the opening of our three year tour of the world, starting here in wonderful downtown Hartford Connecticut. We should travel the world, but we should come back here in the summertime. When it�s nice out, in the open air, we�ll open up those doors and everybody will have a good time, and we�ll have a great time together. Again, thank you so much. This song is for you.